The Terms and Conditions below form a binding agreement (“Agreement”) between you as the subscriber, and us Pavo Communications Sdn. Bhd. (Company number: 861312-T) (“Pavo”). This Agreement shall become effective upon your activation of SIM Card which constitutes your unconditional acceptance of the Services (as defined below) provided to you by Pavo. Should you disagree with our Terms and Conditions, please do not access or browse any further on our website, mobile website and MMSpot mobile application (“Platform”) and/or proceed with the registration and/or activation of SIM Card. By continuing accessing and browsing our Platform, you agree that you have read, understood, accepted and agreed to be bound by our Terms and Conditions. If you are below eighteen (18) years old, you shall ensure that you have obtained consent from your parents or legal guardians before registering and submitting your personal details in the registration form. Pavo ensures all its subscribers enjoy a reasonable usage of the Services to prevent exploitation, fraud, and abuse of unlimited usage of the Services. This Policy establishes the acceptable level of conduct between Pavo and its subscribers when using the Services provided by Pavo. 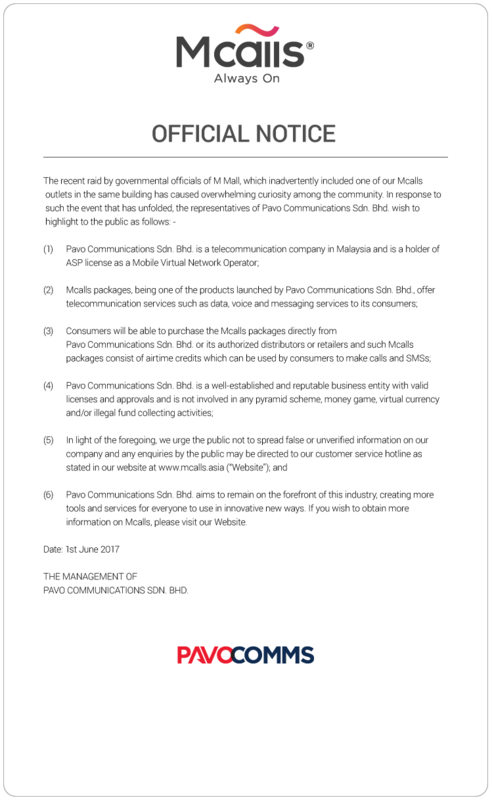 Pavo’s subscribers should be responsible in their usage of the Services and how it may affect other subscribers. Pavo reserves the right from time to time, to limit throughput or amount of data uploaded and/or transferred onto the network and to deny or terminate all or any part of the Services without prior notice if it is in the opinion of Pavo that any person(s) using the Services could cause harm, adversely impacts and/or disrupts the network or Services. If we determine, at our sole discretion, that you are using the Services in violation of this Terms and Conditions or in any other manner that we deem to be unreasonable or excessive, your subscription to our Services may be terminated including not limited to, airtime, data connectivity, declining your renewal to subscribe to our Services. If your account is terminated due to violation of these Terms and Conditions, any unused balances including airtime, and/or data connectivity shall be forfeited. excessive amounts of internet traffic through the continuous, unattended streaming, downloading or uploading of videos or other files or to operate hosting services including but not limited to, web, video or gaming hosting. Pavo may at its absolute discretion suspend or terminate your subscription to the Services arising from the Excessive Usage without prior notice. 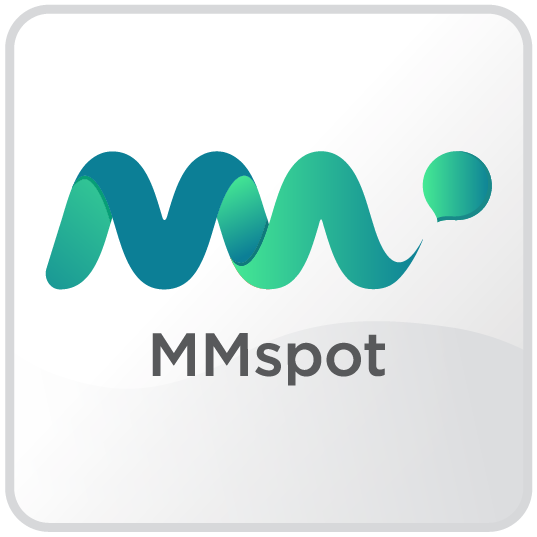 performing any illegal or fraudulent activities using Mmspot mobile application. “Services” means the mobile telecommunication services, broadband services or any other product or services provided by Pavo. Pavo may at its absolute discretion to vary, modify, terminate or add onto the Services in whole or part thereof without prior notice. You are required to regularly review any changes of our Services on our Platform. where the subscriber is outside of our network coverage. You must not resell, distribute or reproduce the SIM Card and must take all precautions against loss, theft, cloning or misuse of the SIM Card. In addition, you shall not transfer or exchange to any person(s) without prior written consent to Pavo. 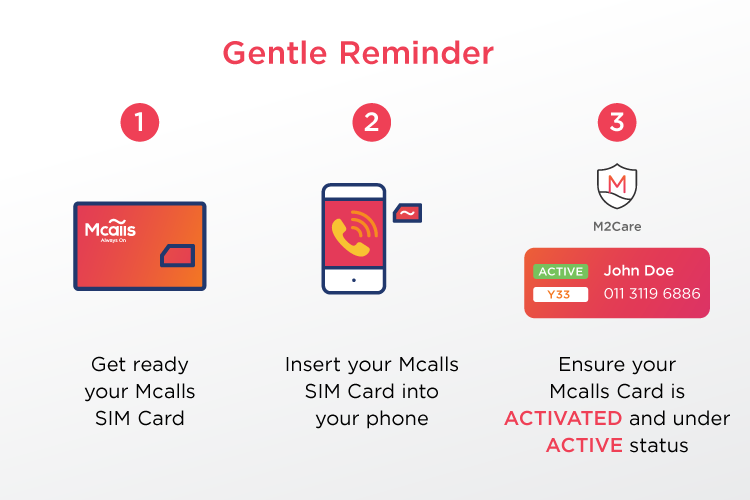 You are advised to activate the SIM Card within Malaysia before the expiry date which is imprinted on the SIM Card. A non-activated SIM Card will not be usable, returnable and/or exchangeable in cash. The SIM Card will still be capable of receiving calls and SMS messages for up till 60 days upon the expiration of SIM Card. A reload must be performed in order to utilise the full Services. If no reload is performed during the 60 days period, the SIM Card shall be terminated from thereof and any remaining balance for airtime, SMS messages, data or any other service or benefit relating to the SIM Card shall be forfeited. You acknowledge and agree that you have given your unconditional consent to Pavo to access your account, including its contents to respond to any service or technical issues that may arise. All applicable government taxes, levies and/or other costs which may be applicable to you by law in connection to the Services shall be borne by you. You shall reimburse Pavo on demand for any such expenses which Pavo is obliged to pay on your behalf. 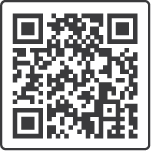 Any information stipulated on this website or any of our Platform which may be referred to from time to time will constitute part of the Terms and Conditions as contained herein. Pavo shall not be liable to reimburse or compensate you for any damages, costs, expenses or loss arising from the expiration or the termination of the top up(s) or SIM Card. any act or omission by you or any authorized use or exploitation of our Services. all expressed or implied regarding the condition, merchantability, availability or fitness of any part of the Services, any service/equipment provided by any third party that is necessary for the access and/or use of the Services or for the quality of the DiGi network or that of any other telecommunications service provider. These Terms and Conditions shall be governed by the laws of Malaysia and shall be subject to the exclusive jurisdiction of the courts in Malaysia. Pavo reserves full rights to at any time, change, revise, amend, delete, vary or add to the Terms and Conditions at its absolute discretion without prior notice to you. 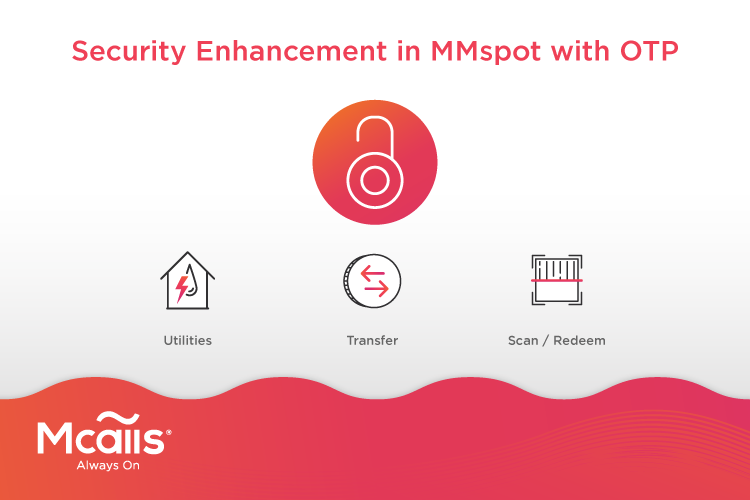 You may call +603 2778 2233 or login to MMspot M2Care for any billing or credit enquiry. Pavo shall not be liable for any loss, damage, costs or expenses arising from your failure to do so. Calls made locally to +603 2778 2233 are chargeable at local flat rate. Pavo reserves absolute right to alter any part of the charges of the Services at any time without prior notice. You are required to regularly review any changes of our charges on our Platform. it has passed the validity period. 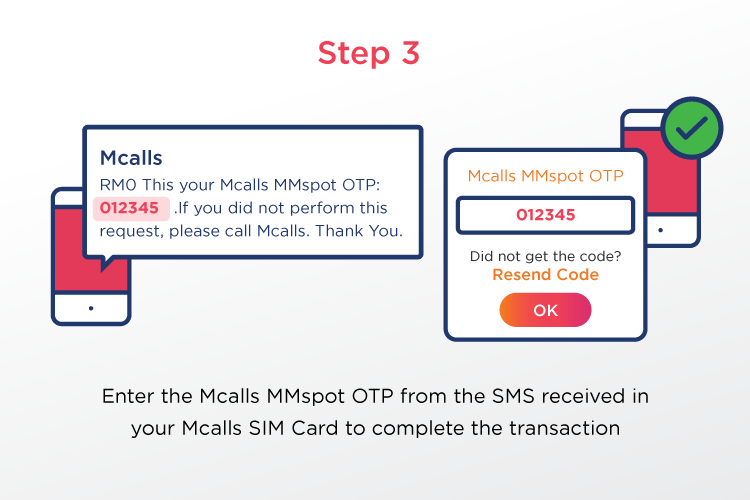 The validity period of your airtime is determined in accordance with the value of the top up(s) purchased through MMspot mobile application. 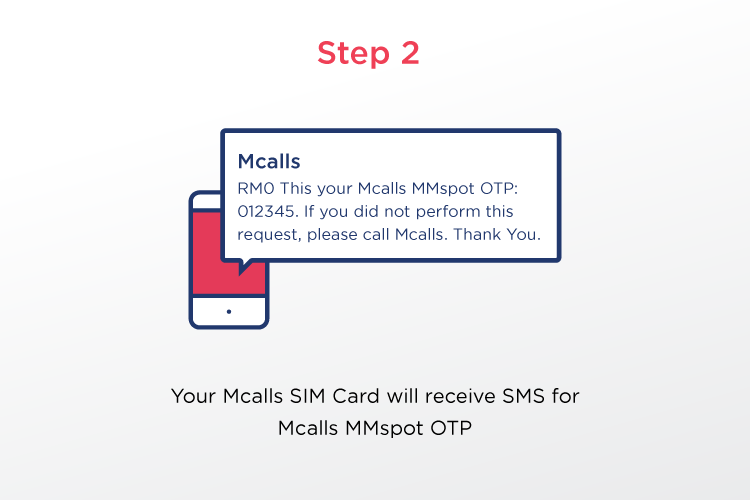 For avoidance of doubt, the validity period shall be effective from the date when you top up until such stipulated date stated or displayed under MMspot M2Care within the MMspot mobile application. The subscribers are allowed to have two (2) or more multiple top up(s) before the expiry of the validity period of the existing airtime; in the event of two (2) or more multiple top up(s),the validity period of the two (2) top up(s) with the highest denomination value shall be effective. Upon the expiry date of the validity period, you shall not be entitled to claim for any refund or use the value of such top up value for any Services or conversion of airtime, return or exchange in cash. The payment made for the top up(s) shall not be transferable or refundable for any reasons whatsoever. Pavo reserves absolute right to forfeit any unused airtime or any airtime expired after its validity period. 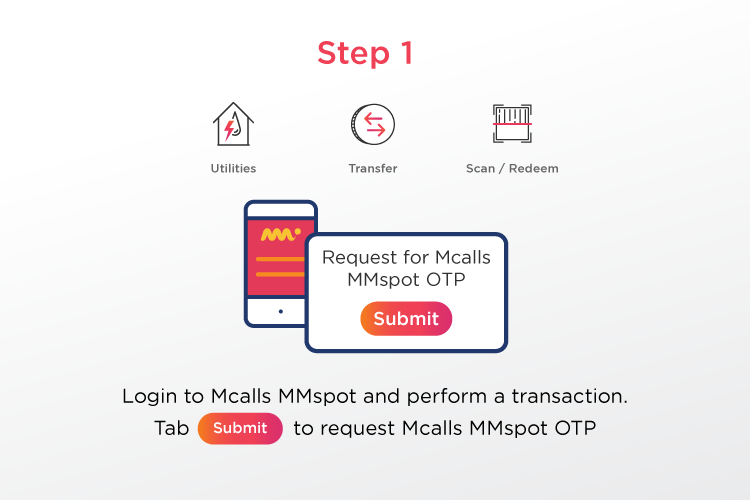 You shall strictly comply with the terms and conditions of the top up(s) purchased through MMspot mobile application facilitating the top up service. Your entitlement for the value added services and other benefits will be subjected to your successful registration as our subscriber (“Value Added Services”). Please ensure that you find out all the terms and conditions applicable to the Value Added Services. Your usage of any part of the Value Added Services implies your unconditional acceptance of all the terms and conditions of such services which may be changed from time to time at Pavo’s absolute discretion without any prior notice.